Just decided to take a wee break away from here..with all that went on..found it a bit upsetting..but I have been busy doing other things and not on the net so much. I had a virus last week and thought I would never get this thing back up and running..but I did it! Not been in the garden much either..its not looking too bad but the rain has spoiled a lot of plants this year. Just putting this pic on..does anyone know what this is? I think its a wild flower or maybe a weed lol, but I quite like it. Hi Pix.....computer virus or you?! I think that's a wild flower...in the wrong place as they say! Pretty blue mix there. . I think a lot of us felt the same way Pixi, its been very quiet on here lately, and I don't come on as much as I used to. Found other things to do as well. After all the bad weather, when we get a nice day we are all outside. Can't help with the name of the flower but it is quite pretty isnt it. Hi Pixi. I'm glad to hear you're all right. I don't like coming on here any more myself. I don't do it so much now. Hi Pixi, I guess I`ve missed something along the way, I wondered where you were, good to see you back though, can`t help with naming the flower but its pretty anyway. Ask Bulbaholic - he will know what it is. I have seen them but cant remember where ! I hope your computer is all better now - they are ok so long as they are working, eh!! Had noticed it was very quiet on here lately - obviously what ever happened passed me by but I did notice some folks are no longer members. 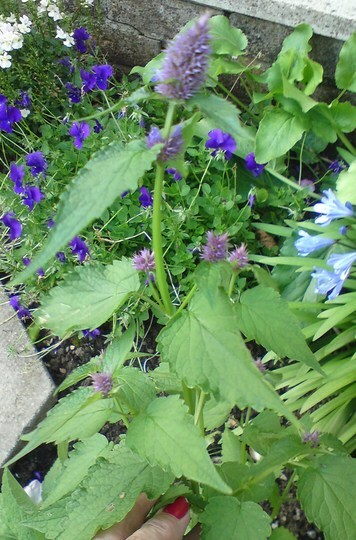 I can't help with an id for your plant but I do think that the leaves look kind of nettle looking in shape. glad to see you back Pixie, I think a lot of us has felt like you the past few weeks, not coming on so much. Agastache is what I thought too, Pixi. Lucky you if it is, they're lovely. Very glad to see you back. Thanks all! and thanks for naming my plant..it looks so pretty so even it it was a weed I would have left it. I wondered where you were Pixie - nice to see you around again. Never look back, and let bygones be byegones. Pam I still have a very confused garden, I have Primulas and Wallflowers coming out now, some flowers already gone over and others in their stride and loving this weather as are most of my shrubs, my cucumbers still very green and healthy and producing more babes and toms are going mad this year and showing no signs of slowing down.. I'm so pleased to see you are still around, Pixi. I did miss you. I have been trying to keep up an attendance record of sorts, but you're right - it isn't the same, lovely, funny, friendly site it used to be, and I don't feel at home here so much any more. I think many of us feel the same way, but at least we can enjoy our gardens during the welcome spell of sunshine. Today has been a perfect day in that respect. What an amazing day it has been today T.bear. I love this time of year. September and October are my favourite months. April and May aren't far behind. Gatt, its been just beautiful here this week, hot sunny days and nice cool evenings and as we always try to breakfast out in the garden the sun is warm but the air cool, perfect (for me). It's pretty much the same here, GM, and I just love it. Why can't the rest of the year be the same? How are you and Suki ? I hope you feel better soon Pixi ..